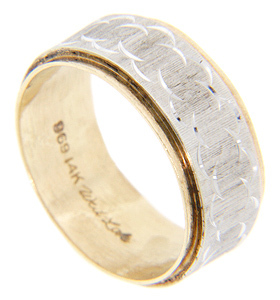 14K yellow gold forms the foundation of this vintage wedding band over which a white gold design is crafted. The design, engraved in the gold, is of a stylized chain/link pattern. Hints of the yellow gold base can be seen peeking out under the edges of the white gold. The ring measures 8mm in width. Circa: 1950. Size: 7. Cannot be resized.